On a recent road trip around California my family and I stayed in Joshua Tree for four days and three magical nights. My sister and her beau had gone the previously year and had raved about the place so I decided to follow their lead and include it in our trip this year. There is a lot going for this little town, so I thought I would break it down into ten reasons to tempt you to visit. 1. 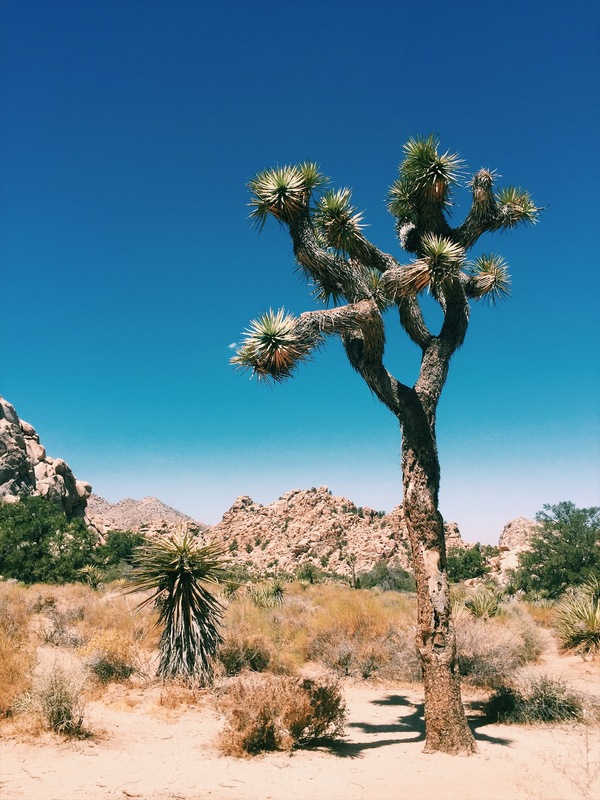 The main reason to visit Joshua Tree is to actually see the National Park itself, which is breathtaking in its stark beauty. The park includes not one but two deserts: the higher Mojave Desert and the lower Colorado Desert. Each have ecosystems whose characteristics are determined by their elevation. 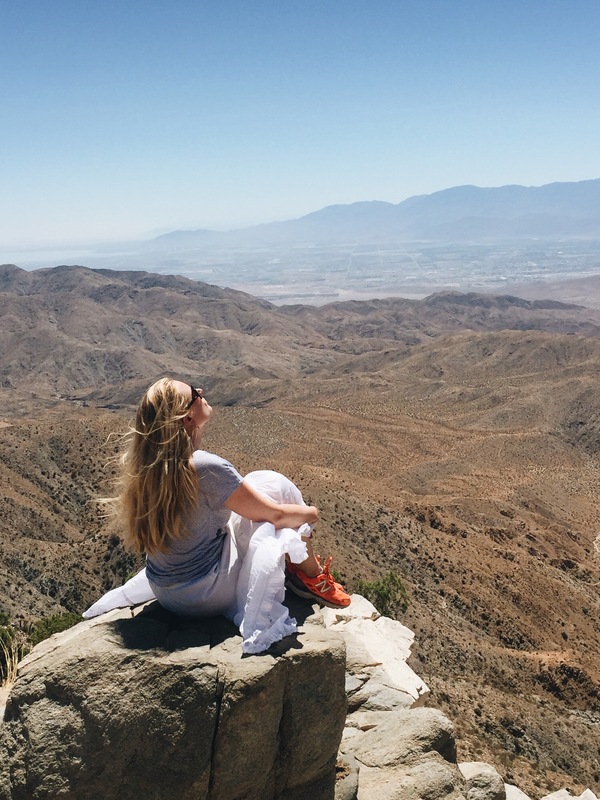 Picking up my dose of Vitamin D – breathtaking views of the San Andreas Fault, Mount San Jacinto, Mount San Gorgonio, and the Salton Sea. The landscape is otherworldly and would not surprise me if other planets have similar terrain. You get that feeling that perhaps Mars is not that different!! The famous Joshua trees (first photo) litter the horizons in every direction, but the park offers so much more in as far as wild life and cacti. Go and seek out ‘Cholla Cactus Garden’ (pictured below), which is pretty cool. These beauties have super sharp needles so wear covered shoes and watch where you are walking. There is a clear short loop through the garden to follow. There is also a plethora of wildlife which have adapted and learned to survive in this desert landscape. You may come across scorpions, black-tailed jackrabbits, rattle snakes, as well as non-venomous varieties, tarantula, coyotes, bighorn sheep, lizards, kangaroo rats (these were pretty cool)and lynx. 2. The nights sky is pretty epic in Joshua Tree due to very little light pollution. Every evening we would head out and sit in the jacuzzi – yes there was a jacuzzi in the airbnb we were staying in (more of that later), and watch the shooting stars and satellites zooming overhead. Sadly the iPhone isn’t advanced enough to have a beautiful photo of the milky way and stars so I can’t include a photo here. Does anyone know an app that perhaps allows you to take photos of the sky at night? Leave a comment below if you do please. 3. Airbnb offers some wonderful places to stay across the world. 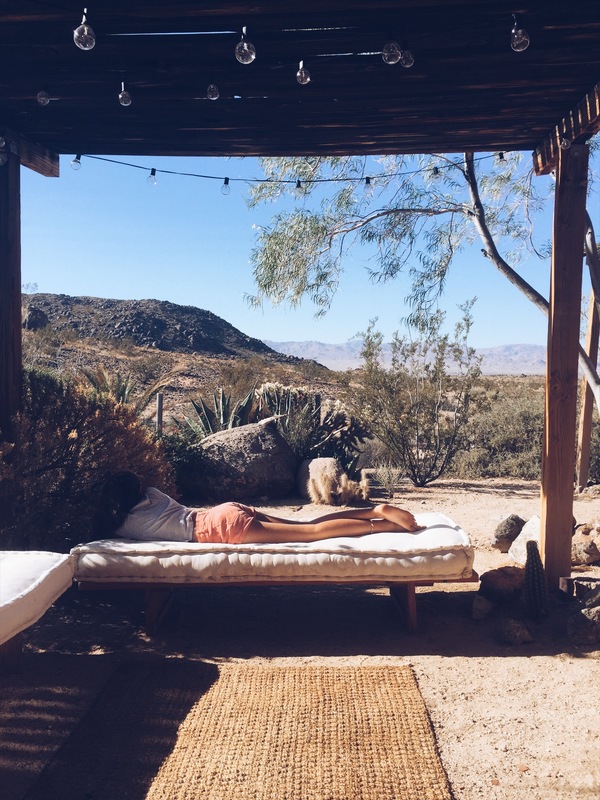 We stayed in the stunning Joshua Tree House (Casita). With over 117k followers I kind of knew that this place would be something special. 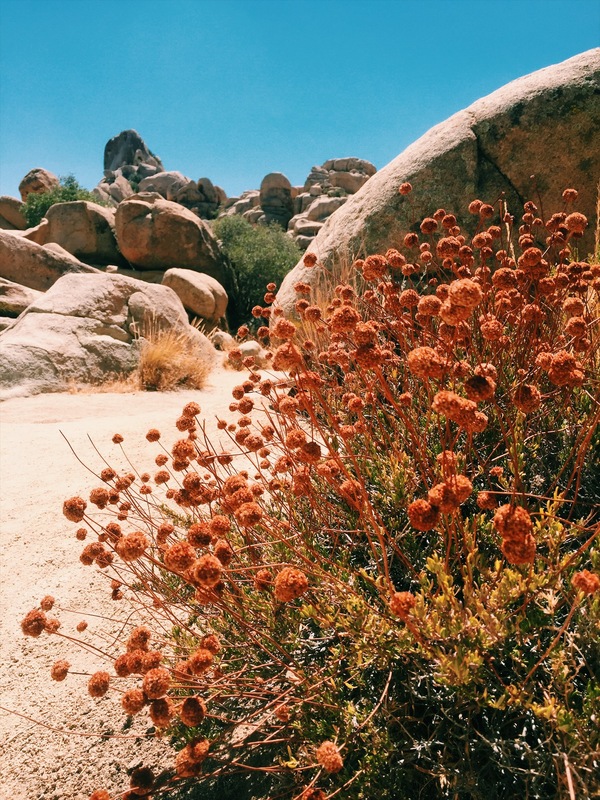 Firstly the location is magical – about 15 minutes from the park entrance and about 10 minutes from the town of Joshua Tree itself. To reach it you drive off road down a sandy track. It’s right next door to Joshua Tree Hacienda, but both places offer privacy. Walking through the front gate you are treated to a stunning desert garden which overlooks a great expanse of desert stretching towards the town of Joshua Tree. 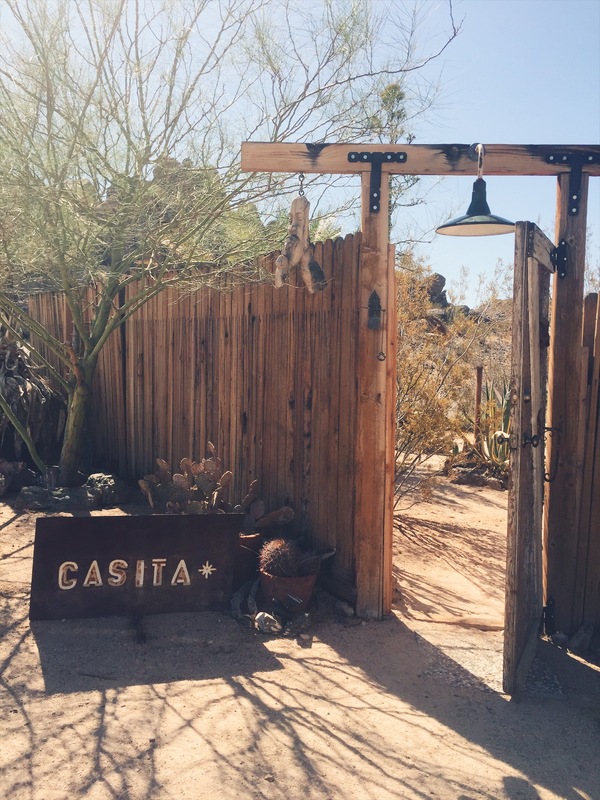 The Casita, which has a dusky pink exterior, has been lovingly styled by Sara and Rich who have oodles of creative flair and taste. The furniture, vintage books, lighting, swing (in the living room) the wood burner, the guitar you can use – all add to the charm of the place. Everything has been thought through and has a meaningful place. It’s also an instagramers dream. 4. If you are travelling with children, they can become ‘Junior Park Rangers’. You pick up a booklet from the tourist office at one of the gates and they need to look for things in the park and answer questions. When they have completed the booklet they return it to the tourist office where a park ranger will ‘test’ them on their knowledge of the park and what they have seen. All being well they will become Junior Park Rangers and receive a badge and little hat. It’s fun for them to get involved and learn more about the park and wildlife in this way. 5. 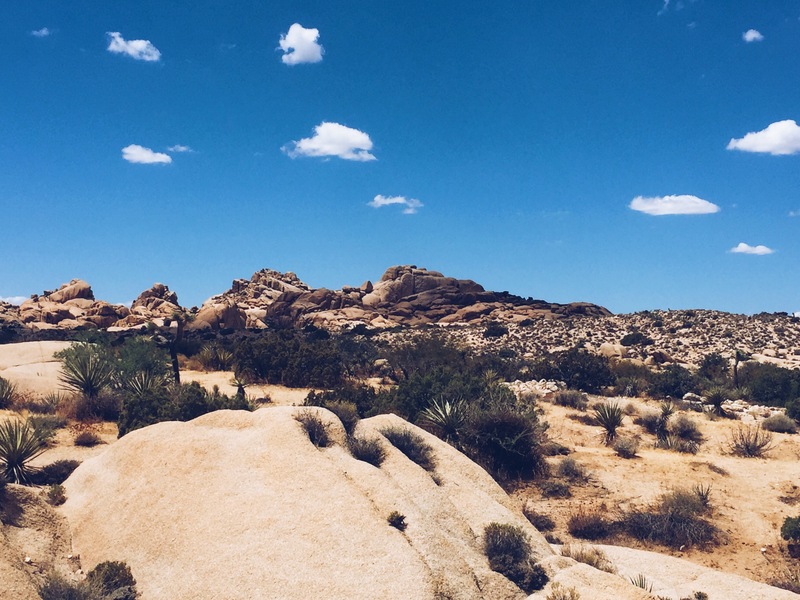 If you like hiking then Joshua Tree National Park offers many trails to follow. There are a few rules though that you need to pay heed to as the desert and sun does not offer those who get lost much comfort for survival. Our favourite trail, which was only 1 mile in length – but perfect considering the heat, was ‘Hidden Valley’. There are a lot longer trails, which could be good when the weather cools off in the autumn or early spring. We were also pretty cautious about going on longer hikes as a couple had gone missing on one of the trials two weeks before we had arrived and, as I write this post they have now been missing for over a month, which is pretty horrific. It is worth following the pointers below before you set off on any hikes. – Obvious I know but make sure your tank of petrol is full – you would not want to break down here if you have taken the car off the main roads through the park and gone done more of a track to reach some of the longer trails. -Carry loads of water with you and in the car. -Stick to the trails as the place is very disorientating and it could be easy to get lost. There are lots of old gold mines in the park, and whilst most of them are covered over apparently there are some that are not. 6. Go and have a sound bath at the Integratron in Landers (which is near to Joshua Tree). Whilst the timings did not work out for us, my sister loved the whole experience on her trip and highly recommends. The structure was designed and built in the 1950’s by George Van Tassel (ufologist and contactee). He claimed the Integratron was capable of ‘rejuvenation, anti-gravity and time travel’. He apparently built it following instructions provided by visitors from the planet Venus. The sound bath 60 minute experience allows ‘deep relaxation, rejuvenation, and introspection’. To book your sound bath click here. 7. Want to live out your cowboy fantasies? 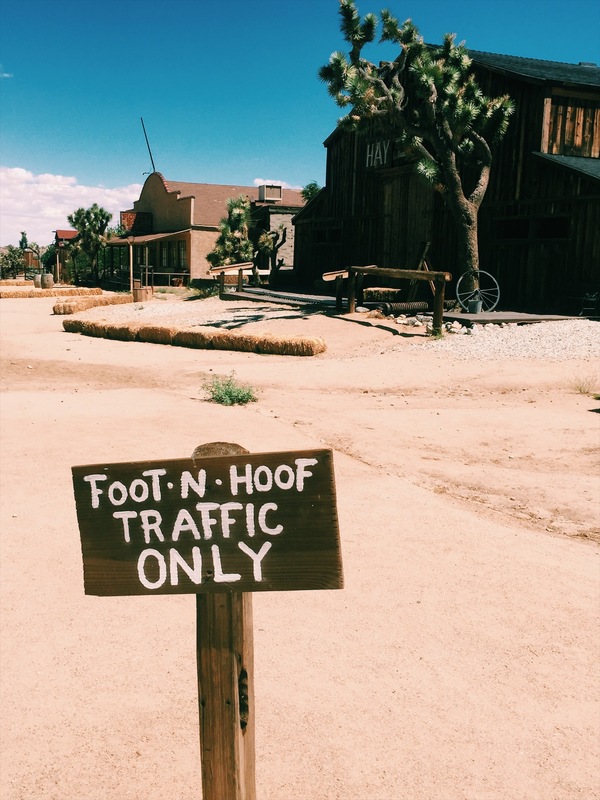 A short drive from Joshua Tree is Pioneer Town, which is definitely worth scoping out. 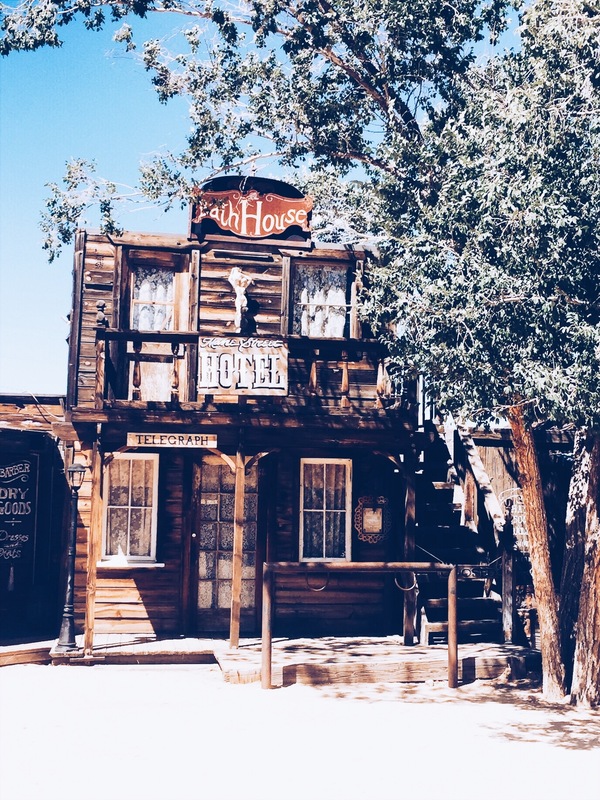 The place is a real life Old Western set created in the 1940’s that actors actually lived in whilst films were being shot – films like ‘The Cisco Kid’. The place is pretty cool and many of the places on the ‘high street’ you can actually go into and there are locals selling all manner of things – including saddles and pottery. 8. 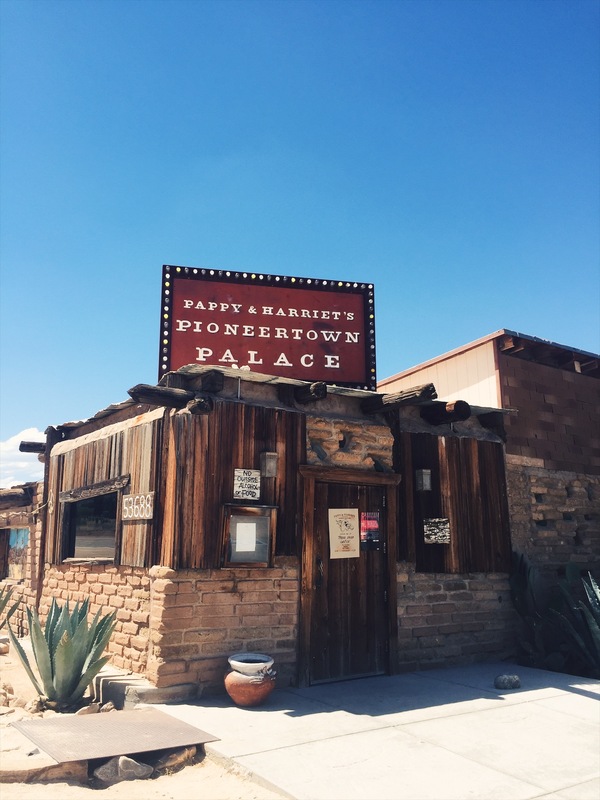 Whilst you are in Pioneer Town head to Pappi & Harriet’s. This BBQ restaurant and music venue is pretty legendary, with big names singers occasionally making an appearance, including Paul McCartney in December 2016. They also have ‘open mic’ for those budding vocalists out there. The venue is great and definitely my kind of venue fitting less than 300 people in all. Intimate and cosy in one. Click here to see who is playing in the coming months. 9. Love vintage clothing and eclectic antiques? 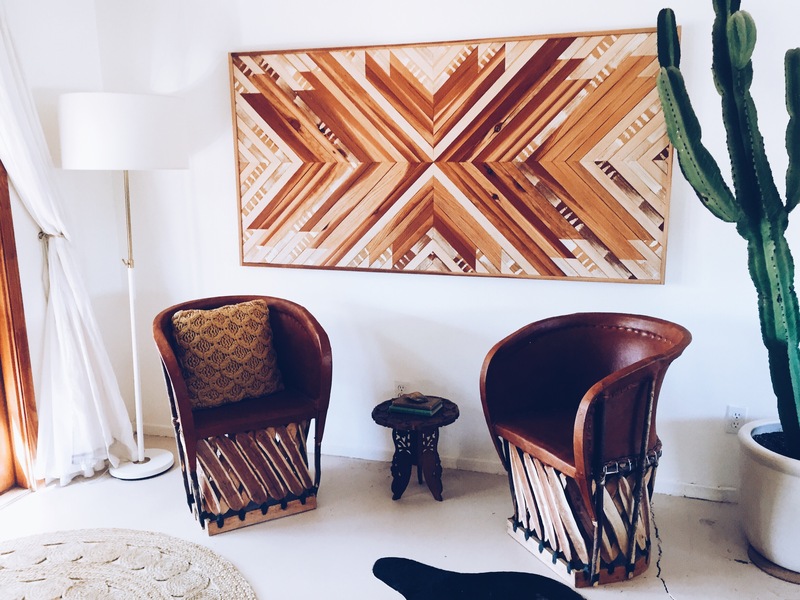 Then Joshua Tree and neighbouring Yucca Valley are definitely worth exploring for picking up that unique outfit for Coachella or Burning Man festivals or that special piece for your home. Most of the boutiques are based on or near by Twentynine Palms Highway. 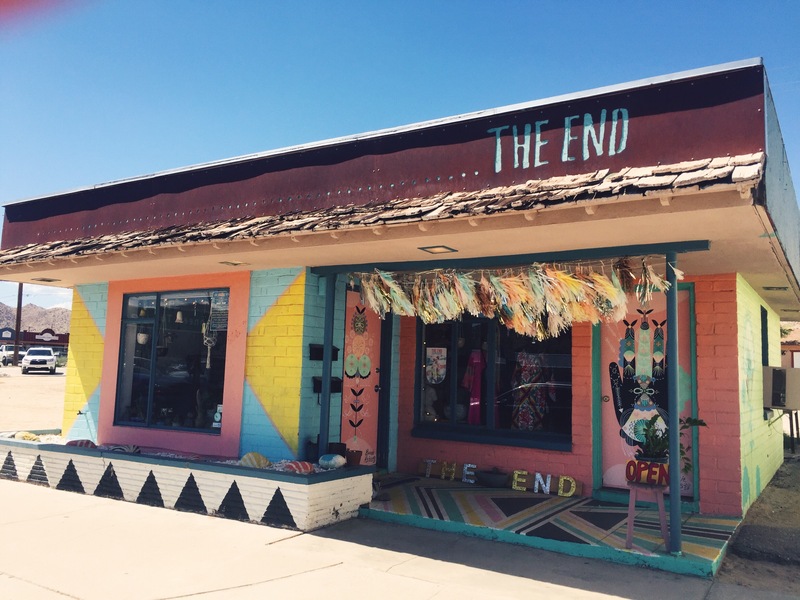 You can’t miss the brightly coloured exterior of ‘The End’ which is packed to the brim with brightly coloured vintage and contemporary clothes. 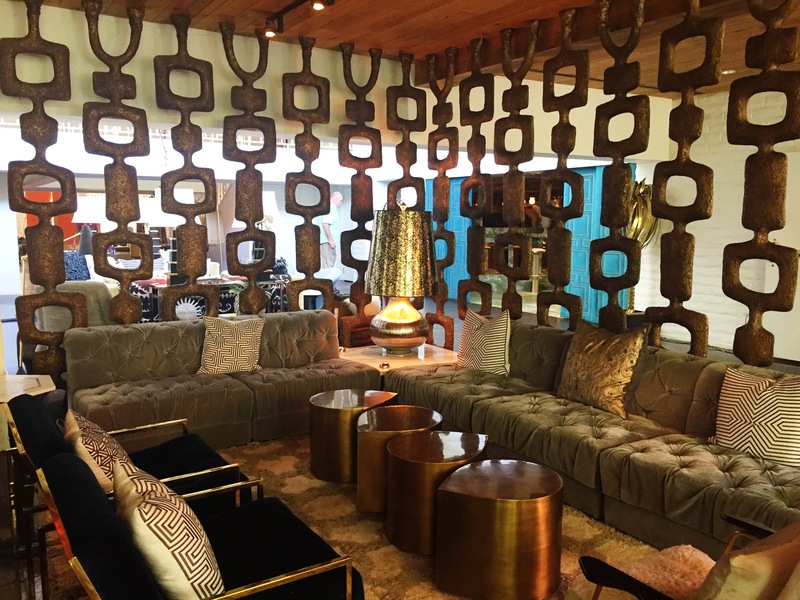 Also worth checking out is the ‘Hoof & Horn’, ‘Funky and Darn Near New’, Ricochet Joshua Tree, 62 Vintage Marketplace and Pioneer Crossing and Antiques. 10. Under an hour away is beautiful Palm Springs. If you think Joshua Tree is hot then wait until you get to Palm Springs. In August it is SO hot that even restaurants with tables on the pavement are spraying diners with cooling water spray. This place sizzles but is also achingly hip. If you love midcentury modern design then you will be in heaven. We only stopped briefly (note to self to stay a few days in the future) but managed to soak up the vibes of the stylishly sophisticated, The Parker. 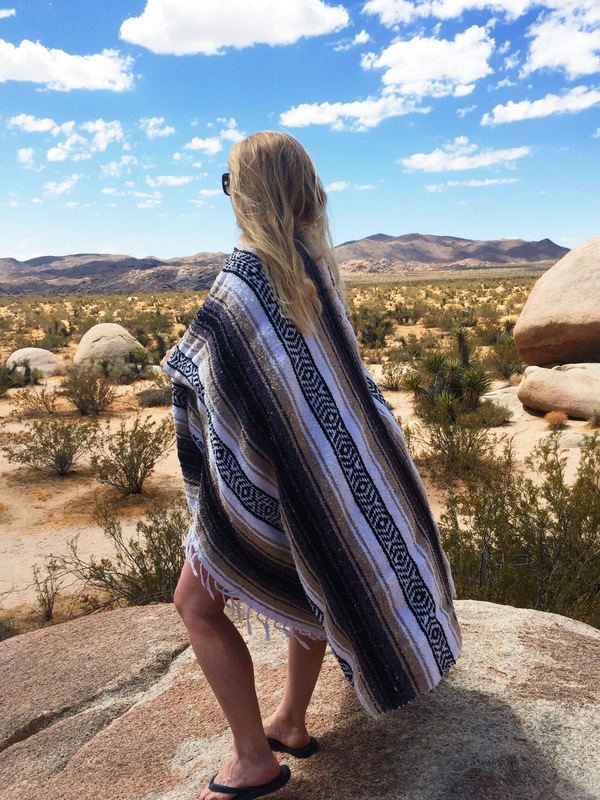 This entry was posted in Away Days and tagged california, Joshua Tree, Joshua Tree National Park, Travel. Bookmark the permalink. Thank you. Have become head over heals in love with the cacti since my stay at Joshua Tree. Am even wearing a t-shirt with them on it today. ;0) For plants and trees to exit and thrive in the desert is pretty incredible. Survival of the fittest. Same goes with the wildlife in the park. Thanks for commenting and welcome to my blog. This is awesome. It is now on my bucket list! Love the pictures!! Sounds good right. Glad you liked my top 10 tips on Joshua Tree. Thanks for commenting.